Beaver have long been pursued for their fur. Recent public opinion has slowed the fur industry and allowed beaver to prosper. The once steady harvest is at all time lows and consequently, beaver populations have grown. This growth has forced the beaver to find refuge in any pond, lake or river that will house them. 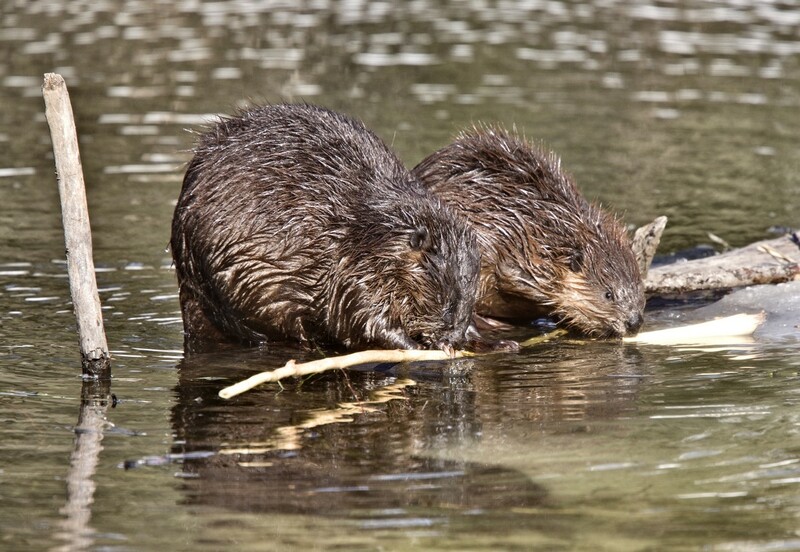 Increasingly, beaver are finding their way to water privately owned and with this migration, conflict with man. The destruction they do is in general not welcome. Skilled trappers who no longer are able to sell beaver fur to make a living are now turning to nuisance beaver trapping as a way of life. 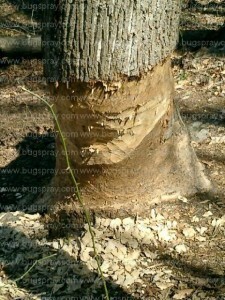 Beaver can cause quick damage to trees which in turn leads to tree death. 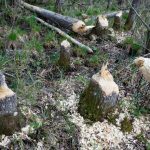 Beaver can cut down several trees down in a single night. They will dam water flow and change desired currents or water levels. Most important, they are nocturnal and hard to hunt. 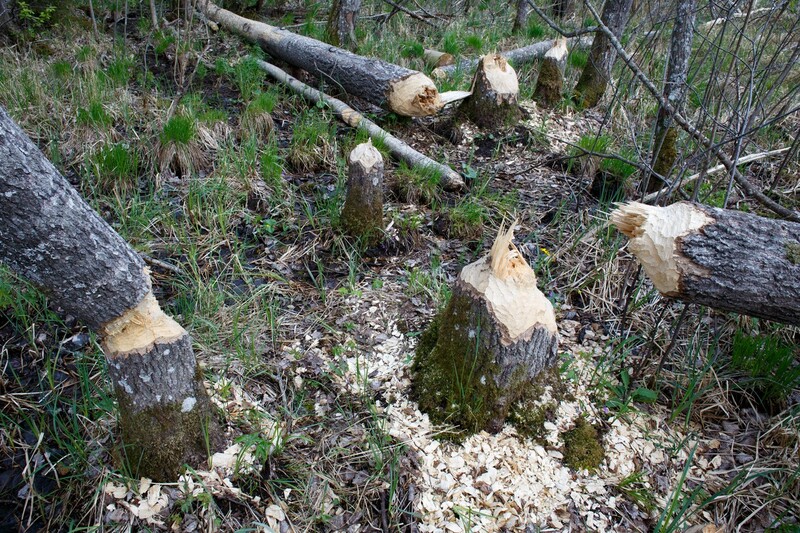 This is why trapping beaver has long been the most productive way to control nuisance animals. Beaver families are centered around the female. She is the foundation responsible for the growth pattern of the colony. If food is plentiful, she will have 2-4 young a year and maybe more. Babies will stay with the female for at least two years and sometimes over three. Colonies can rapidly reach 12-15 animals if local food supplies will support such numbers. If food is scarce, young beaver will be forced out on their own at younger ages. 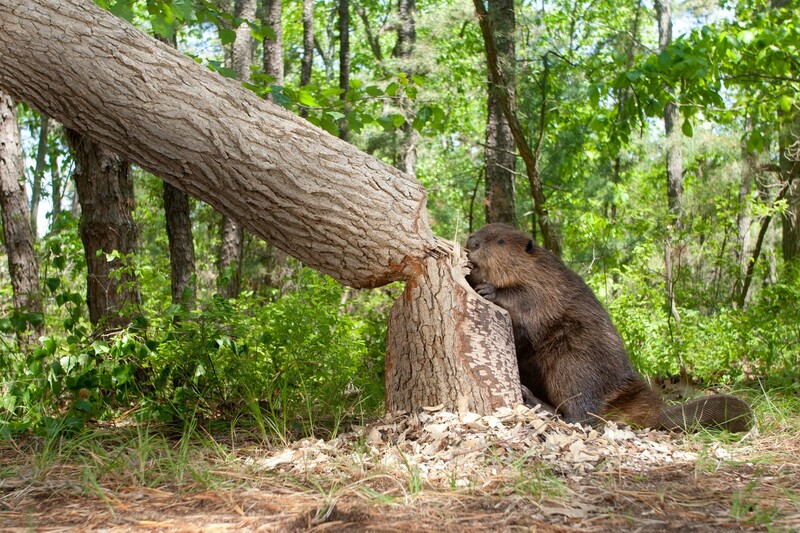 These young beaver will randomly chew trees and then leave. This activity is particularly frustrating because such immature beaver will cause a lot of damage and then move on only to cause just as much damage a hundred yards away. Older beaver will be more set in their ways and easier to follow. Once active, their patterns will be consistent as they methodically work trees and waterways. Young beaver are more inconsistent and difficult to track. Knowing the local colony could prove helpful when trying to trap nuisance beaver. Beaver are strong, nocturnal and able to cover large areas in short time. They swim very well and can negotiate the strongest currents any river can produce. 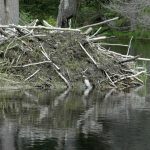 Once a beaver has decided it wants to live in any given stretch of water, it will build a lodge and begin to mark it’s territory. Tree cutting and unwanted damage will soon follow. At this time, most people are ready to take whatever measures are necessary to stop the destructive tree killing. Beaver will cut any tree but seem to be fond of the prettiest trees they can find. Cherry, dogwood and birch are quickly found and pine is generally liked too. Many tricks and repellents have been devised over the years to stop beaver from damaging trees but few if any work. At this time we have a liquid treatment to preserve trees as well as a sound repeller which will keep them off your land. 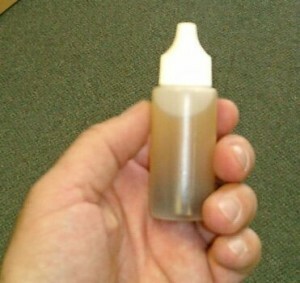 The only product which will stop them from chewing on a tree is a non drying “glue” like material called 4-THE-BIRDS. This material is clear and tastes bad. You can spray or paint it on the tree. One gallon can cover 10-20 trees and treatments can last a year or more. For essential protection, treat all the way around the tree trunk from 6″ up to 3 feet. This ensures you’ll be high enough to stop the biggest beaver who can stand tall. For a few trees or less, paint on the treatment using a standard “wide” paint brush. 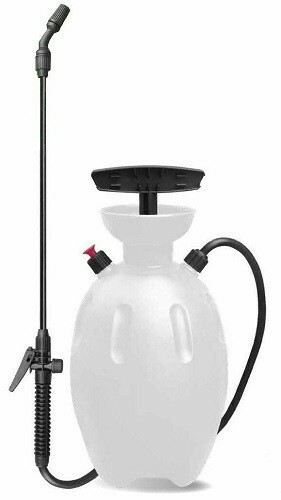 For 5 or more trees, consider an inexpensive PUMP SPRAYER. 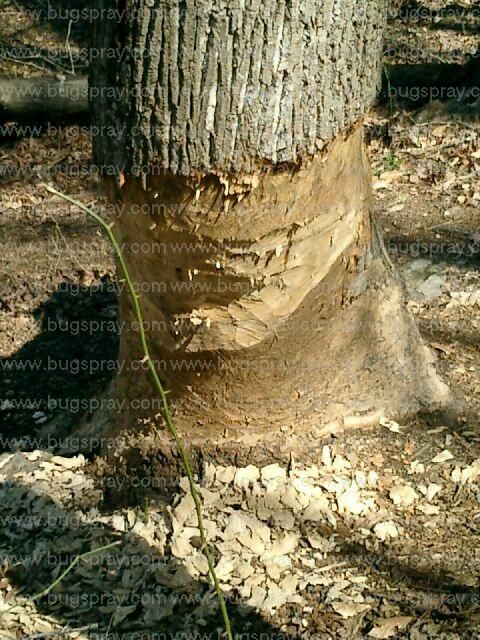 Once applied, beaver will not touch the gooey product or the protected tree. The treatment won’t hurt the tree or non-target animals since it is NOT a poison; it simply repels chewing animals (like beaver and porcupine) because it’s gooey and irritating to the skin. Your second option and definitely the “easier” option to employ is a SOUND REPELLER. Our unit is quite unique and different from any other being offered in that it combines both ultra sound and audible sound as well as light. By default, our unit sends out a strong ultra sound beaver do not like. If you’re trying to protect a thick stand of trees on unlevel land, power the repeller using the included AC power supply. This will let you keep it always on. Ultra sound will travel 100 feet or more and beaver will detect it from afar and stay clear. Plan on running the unit at night with the frequency setting half way (in the middle). Our units can be configured to run all day and night, night only or day only. For beaver, night only is usually fine. You can also rely on battery power using 4 “c” cell batteries. When powered with batteries, you’ll need to rely on the motion detector to trigger the unit. Repellers set up this way will then send out ultra sound when triggered but also flash a the light bar on the front of the device as well as the red indicating motion detector light which stays on steady. There is also an audible sound you can turn up (or off). When using it with batteries, we recommend dialing up the audible sound to a 40-60-80 setting so when the unit triggers off, it will send out a scary audible sound beaver do not like which will help scare and keep them away. Units can be mounted on trees but since they’re very much “directional” and only they won’t be able to protect trees “behind” their line of sight. For this reason, its generally best to set them out a distance away from the trees you want to protect but keep them pointed in their direction. If you have established beaver populations over your property, a simple repellent won’t keep them away. 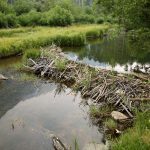 When beaver start building dams, clogging culverts and causing water issues, you’ll have to trap them out to stop the damage. There are several ways to trap a beaver including live trap and kill trap options. 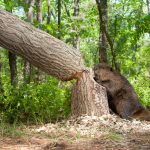 This next section of our article will go over these various methods and offer tips and suggestions on how to successfully trap nuisance beaver. These methods can be used used in rivers, streams, ponds or lakes. 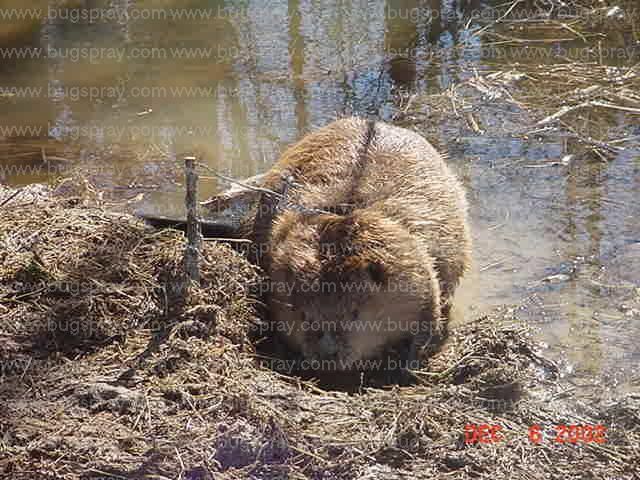 There are four types of traps commonly used to control nuisance beaver. Kill traps, leghold traps, snares and live cages. Kill traps have been used to take beaver for as long as trapping has been done. In the 1960’s, Conibear (aka: body grip) traps were introduced and quickly became the most popular style used. Bodygrip traps are kill traps. They will squeeze the target animal tightly and quickly so there is no evading the jaws. Death is instant and because of how the trap is set, it rarely misses. Bodygrip traps like the BG 330 or the BG 220 are still the mainstay of any successful beaver trapper. The less common BG 280 can also be used. Most people will employ a pair of TRAP SETTERS when going afield; trap setters will allow you to safely and efficiently collapse the springs. 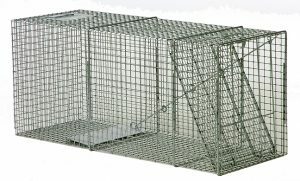 For most novice trappers, the strength needed for any of these traps is easier to manage with setters. 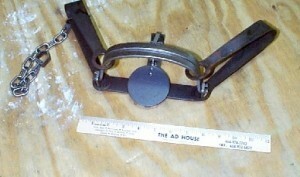 The Bodygrip 220 traps measure 7.5″ x 7.5″ and are the most common size used for beaver. This size is large enough to catch animals 50 lbs or less. Bodygrip 280 traps measure 8.5″ x 8.5″ and aren’t nearly as popular as either 220’s or 280’s. But they work the same. Bodygrip 330 traps measure 10″ x 10″ and will handle the very biggest beaver. Trap setters should be used for any beginner/novice trapper. 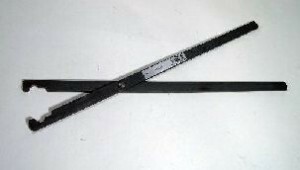 Their scissor design give the user the leverage needed to compress the springs and latch them securely prior to making sets. 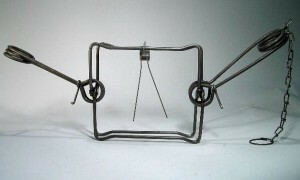 To make the perfect set, consider anyone of the optional trap stands designed for Bodygrip traps. Trap stands hold traps upright so active animals can pass through the jaws. Beaver are very much creatures of habit and their trails will be used over and over. Traps placed on trails will often yield results. Since beaver are mostly nocturnal, its easy for them to miss the trap until its too late. The key to successful trapping is not so much about the trap as it is about the set. So first, try to isolate trails, slides or runs where beaver are active. These locations are usually your best bet for success. If you have beaver huts nearby, there will surely be trails close to the hut. Inspect the shoreline surrounding the huts to locate active areas and use these to your advantage. 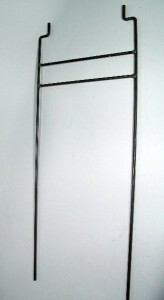 In shallow water or on land, the 18″ SOLO STANDING STAND is popular. It can handle all three sizes and using the 18″ rebar, you can hide the stand and anchor the set well. 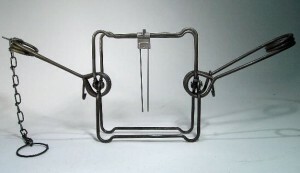 For sets in water where the depth gets to be 6″ or more, traditional trap stands will allow you to get the trap to the bottom of the trail and not have to reach all the way down. These come in various lengths. Trap stands can be deployed on land or in water and should be used for most any set when using a body grip trap. For deeper sets, the 20″ 330 SHORT TRAP STAND is the next length available. For deep water sets, the 330 SUPER STAND 46″ is almost 4 feet long. Leghold traps, like Coil and Bridger traps, can be set to catch beaver alive. But you can set them in ways to cause death too. Trappers use them both ways depending on the animal they are trapping and the type of set they design. These traps come in many sizes and are used for many other animals and not just beaver. The most common size for beaver are the COIL #3. These traps have a 6″ wide jaw spread and are fairly easy to set. 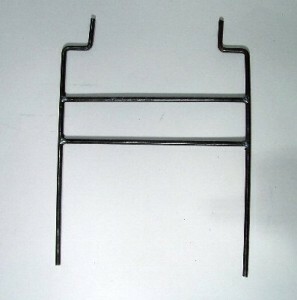 The more “traditional” design is the long spring. These have been around a long time and traps like the LONG SPRING # 4 and LONG SPRING # 5. have caught more beaver than all others combined. And though the #3 Coil Traps and the long spring #4 have 6″ wide jaws, there can be times when the slightly larger LONG SPRING #5 trap might be required. Long spring and coil traps are used in areas where beaver are thought to be resting, feeding or marking territory. Unlike the bodygrip kill traps which are best used where beaver are moving, leghold traps are best when employed where beaver are likely to forage, rest or mark. These locations can be found along shoreline close to water. Look for footprints or chewed wood. Beaver will usually have several such locations close to their huts and it will usually be where the ground is soft, muddy or sandy. Often times you will find discarded sticks or twigs where they feed. Other times there will be heavy scented castor piled up where they have marked their territory. Beaver routinely mark their turf to tell other beaver the area is occupied. In fact using CASTOR LURE (seen below) in these areas can be required to get beaver to move about where traps have been set. The smell of another beaver can many times distract them enough to miss the traps hidden under a light coating of mud. In recent years, snaring has become another popular way to catch beaver. SNARES are made from cable, most commonly 3/32 steel, which is able to close around the beaver as they enter a looped end set in their path. Designed to move in one direction by using a special cam lock mechanism, snares will close around necks, legs or body sections of most any animal that enters. 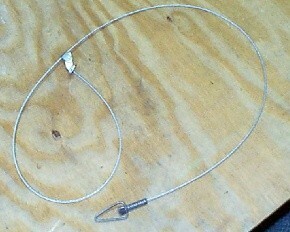 Once caught, the snare will hold the target animal in place till the trapper checks his sets. Generally used to catch beaver alive, be aware that trapped beaver in a snare will be angry. And beaver are quite strong so be cautious if you plan on handling the animal alive. Beaver may be slow but when caught and held against their will, most will put up a strong fight. And they will deliver a nasty bite when possible. Beaver lure or bait is not needed when using kill traps. Bodygrip traps are placed where beaver are moving and a proper set will be hard for them to notice before its too late. But for leghold traps, live traps or snares, the use of bait can help. Glandular lure (beaver castor) can also help. In general, there isn’t a “sure-fire” bait that will work for every beaver in every scenario. That being said, they do seem to have a sweet tooth for Poplar trees. If you don’t have any Poplar trees on your property, create your own. Gather up a few fresh, tender selection of small branches 1/2″ to 3/4″ thick and 1 foot or less in length. Debark the collection so they shine nice and white. 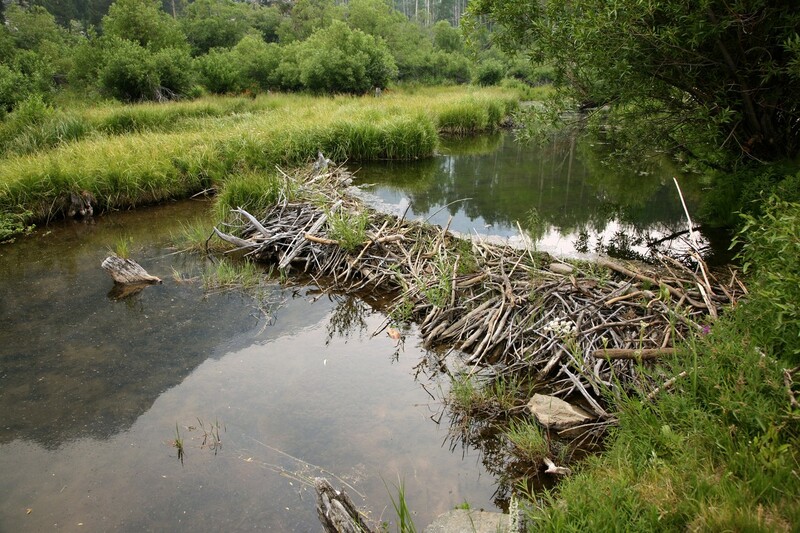 Place 4-6 of these sticks on a feeding ledge or other shore area where you see beaver sign. Next, set up leghold or snares around the offering. Lastly, place 5-10 drops of POPLAR OIL on the sticks. This “bait” will work with just about any type of beaver trap set and seems to be an effective way to make a good set any time of year. Beaver love poplar trees and will be curious about any offering using this scent. If you are unsure about where they’re feeding and cannot clearly establish logging paths or trails, you can create “mock” scent mounds to get or trap where such mounds exist. Scent mounds are where beaver will go to mark their territory. Such mounds are commonly used to catch beaver since they seem to be more vulnerable at such locations. And even if you can’t locate a “real” mound, you can create a fake one. Look for areas that rise up along shallow shore lines, sand bars or other areas where the water level is low. If can find some located close to where beaver have been seen building dams or damaging trees, use this to your advantage. Create scent mounds but adding CASTOR LURE to the ground. When done properly, placements should be in a positition to allow their scent to drift in the direction of where beaver have been seen. Once detected, Beaver will be curious and have to inspect to see what’s leaving such a smell. 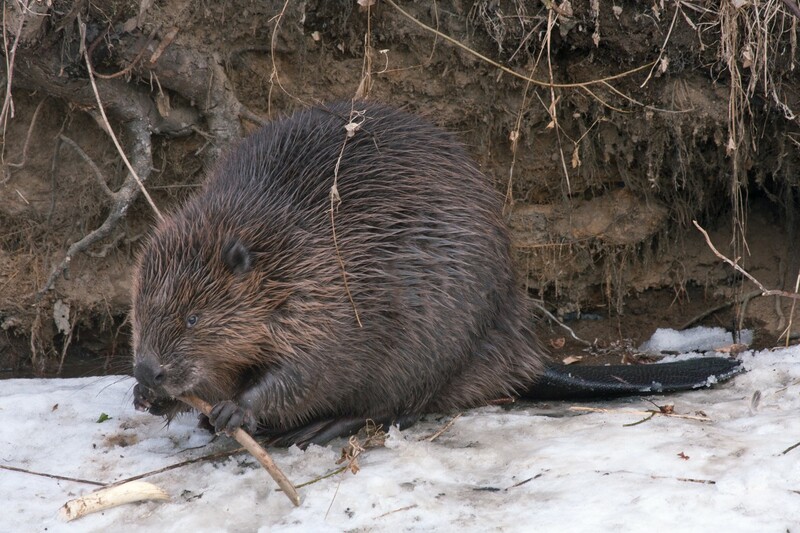 Castor scent is released by special glands specific to the beaver who visit these locations. 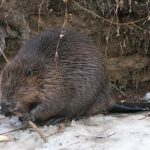 New beaver will scent territory borders during seasonal fights, mating seasons and when young are forced to move out of the colony on their own. 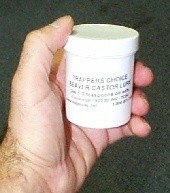 Using castor lure, you can pretend to be another beaver and with any luck, trick them into stepping into your trap set. Live trapping beaver is not commonly done but it is possible. Like most any animal caught with a live trap, the key is both trap placement and the lure used to get the animal inside the cage. With beaver, the larger the trap the better your chance of success. Our LT152248RD TRAP measures 15″ wide by 22″ tall by 48″ long. This deisgn is plenty big and when placed alongside beaver slides or feeding stations, you’ll have a chance of success. To get beaver inside the trap, use the POPLAR OIL BAIT on a selection of sticks as explained above. Poplar oil will get most any beaver’s attention and can be enough to get them to enter your trap. If you’ve already tried using a traditional trap and cannot get beaver to enter, consider a new design specific for beaver. One such set is over water which is very deep. Basically, hanging it out over deep water and strapping or anchoring it to a tree will work well for beaver. Such sets should be barely submerged with the trigger and bait above the water line. This insures that most any beaver will have to swim over to investigate. You don’t have to hide or bury the trap and you don’t have to worry about a trapped beaver drowning since it will elevate them above the water line when set right. 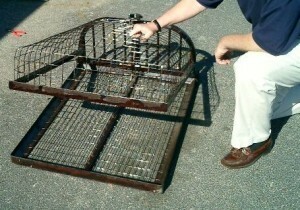 Known as an EASY SET BEAVER TRAP, this “suitcase” looking trap is easy to set and highly effective for beaver. The mechanism is easy to set and traps can be placed in many locations with success. Easy Set Traps use no springs but instead a simple locking mechanism that keeps the top closed tight once it seals. This trap is very versatile and excellent for most any sets. For demonstration purposes, we have several videos which will show how to use the Easy Set in different areas of ponds, rivers or lakes. For the beginner, the Easy Set is a good option. 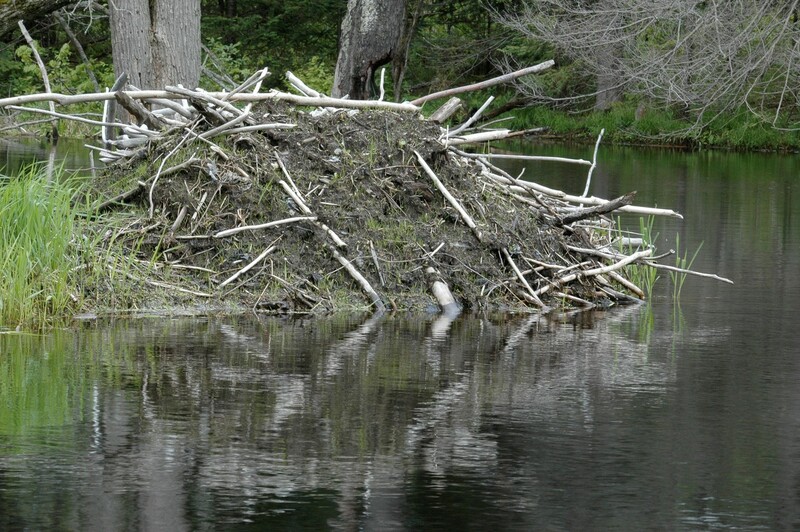 Here is the Easy Set being set on a beaver dam, one of the most common places to place any type of trap. As experienced trappers will tell you, making a set “in the water” will always improve your success rate when targeting beaver. The Easy Set is unique in that it’s both easy to set and easy to deploy in open water. Here it is being set up in front of a culvert pipe. 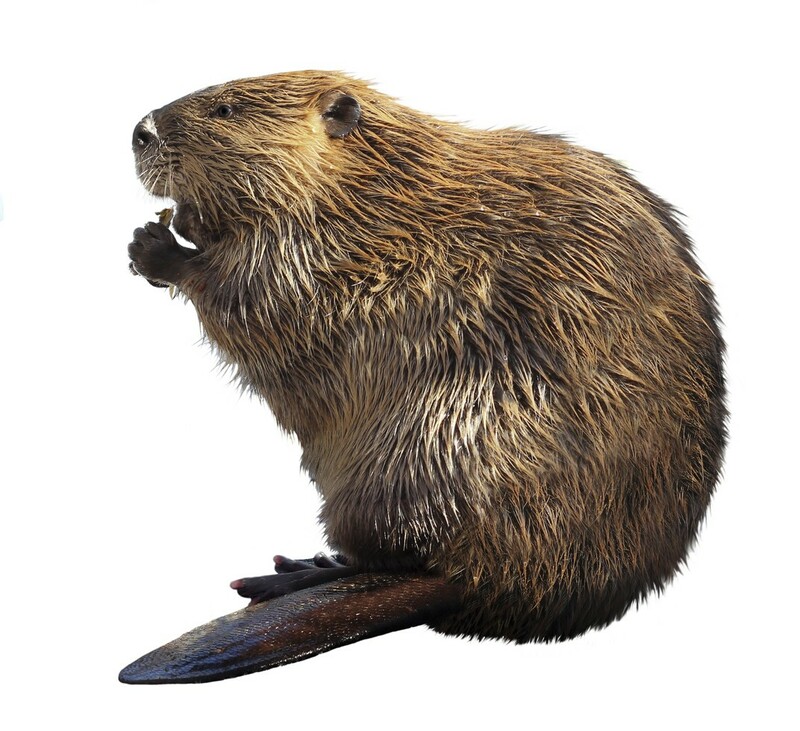 Beaver commonly clog or close such pipes which causes flooding. The Easy Set is ideal for this environment. A similar location is a drainage ditch. When clogged, flooding will happen. Making sets in drainage ditches is commonly done for beaver and this video shows how to best take advantage of this situation. And for most people, the “open water” set is the most feared. It’s hard to imagine where you might be able to make a set when beaver have access to miles of shoreline along large lakes. But as this video shows, there is clearly a pattern or “trail” beaver like to follow and with a little detective work, you should be able to locate such trails where any problem situation exists. Remember, the clips above show sets in common locations where beaver can be a problem. And though the Easy Set was used in the presentations, several of our other traps can be used just as well. Regardless, you must “taylor fit” whatever trap you decide to use and be sure to add plenty of Poplar Oil if you don’t have the real local food to use as bait. Beaver are clearly controlled by smell and with the right combination of lures and bait, you can get them to make mistakes and fall victim to most any style trap. Trapping beaver is a skill and one that cannot be learned overnight. However, like most trades, experience is the best teacher. If you are inclined to try trapping beaver yourself, there are two booklets which will prove to be great sources of information. 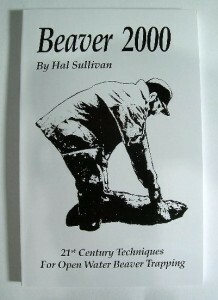 The BEAVER BOOK and BEAVER 2000 cover everything you need to know about how to trap beaver. 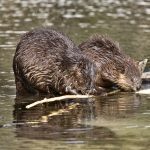 The Beaver Book is somewhat dated, but the information, diagrams and techniques are all useful today. Beaver 2000 covers much of what The Beaver Book discusses but gets into the use of snares as well. 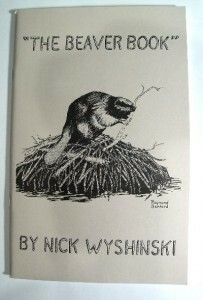 If you want a basic understanding of beaver trapping to deal with a small problem, get The Beaver Book. If you think snaring might be how you want to trap, get Beaver 2000. If you want to know more than you’ll ever need to know about beaver, get both! Each book discusses several sets. 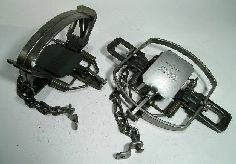 Some of these use Bodygrip traps, coil traps and bridger leghold traps. Sets are pictured in each book so you are able to visualize how you will actually place the trap in the field. Numerous tricks and setting techniques are detailed. Mound sets using Castor Scent are discussed in both and generally are a good way to catch beaver during different times of the year. 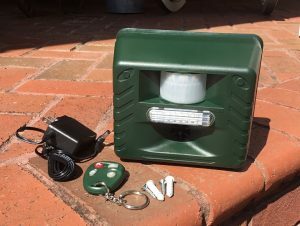 In summary, there are basically two types of people who are reading this article: those of you who know what traps you want and how to use them and those of you who have nuisance beaver and want to learn how to trap. For the first type, you can see our traps listed above by simply clicking on them where they appear underlined in the text of the article. In general, we stock everything and ship same day as ordered. For those of you who want to try your hand at trapping and aren’t sure how to start, here are a few suggestions. Get at least one booklet. The Beaver Book is good; getting both is even better. Although each book covers more than you need to know, focus in on the trap sets to learn which one will work for your situation. Each book covers sets for dens, open water, logging trails, feeding beds, mounds, beaver ledges, waterways, and other great locations to trap beaver. If you have a beaver problem, a set that will work for you will be detailed in either book. Trap selection seems like the toughest decision, but it really should be the simplest. Just ask yourself if you are a novice or a professional. If you are a professional, you know what you want to do. If you are a novice, the question is whether you want to trap the beaver alive or dead. If you want the beaver dead, the Bodygrip 220’s and 330’s are for you. Although the leg traps and snares are “live traps” in that they catch the animal alive, most any beaver can be too much for you to handle as they are quite strong. Catching one in a cage may require more technical setups, but any beaver caught in a cage is easy to deal with since it is confined. Beaver in a leg trap or snare are mean and ornery and they won’t hesitate to bite. A novice doesn’t have the skill to deal with such an animal. The Suitcase Live Trap will increase your odds of catching a beaver live but will cost more. Get some Castor Scent or Poplar Oil. These scents have a wide range of uses and will generally help even the novice get more animals. The books detail how to use some and our formulation works great. Beaver can become an expensive nuisance animal once established in ponds and rivers of your property. Watch local activity and be prepared to deal with populations that grow too large. Repellent sprays will work for migrating animals, but you will need to trap out persistent beaver which refuse to leave. I JUST WANTED TO KNOW HOW MUCH ARE THE SUITCASE BEAVER TRAPS.